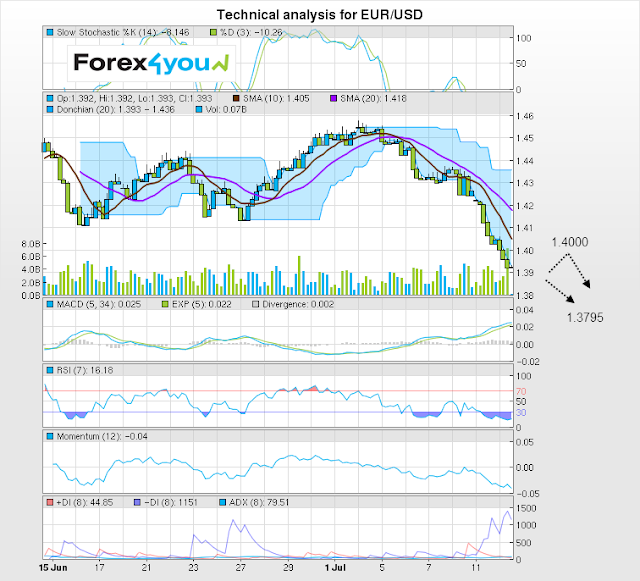 The EUR/USD pair has broken out from the triangle on the daily chart and fallen to the 1.38s. Whilst overall I am bearish, price has bounced this morning after hitting formidable support from the 200-day MA and the major trend-line from the June '10 lows. The bounce has already taken it to 1.3960 and it is possible it could go higher, as there is no sign of weakening yet. Targets to the upside include 1.4000 and then 1.4150. Point and figure targets are still pointing down at 1.3795 and 1.3700 and once the rebound has run its course I foresee a probable bearish decline to the lower 1.30s at least.